How Much Does Pre-Seed Equity Really Cost? tl;dr: Startup capital is expensive. The United States is home to a lot of startup hubs, hugely successful technology companies, and investors at all stages. The US is also home to many successful incubator and accelerator programs, many of which have expanded beyond American borders in recent years. As you probably already know, accelerator programs help very early stage companies find their footing. They accomplish this by creating a community of founders and connecting them with mentors, advisors, and providers of important services that startups need access to: lawyers, accountants and other folks who keep companies in good standing. These services usually don’t come for free. Rather than have startups pay for these services in cash (which, famously, early-stage startups don’t have a lot of), accelerator programs invest cash and provide these services in exchange for equity. 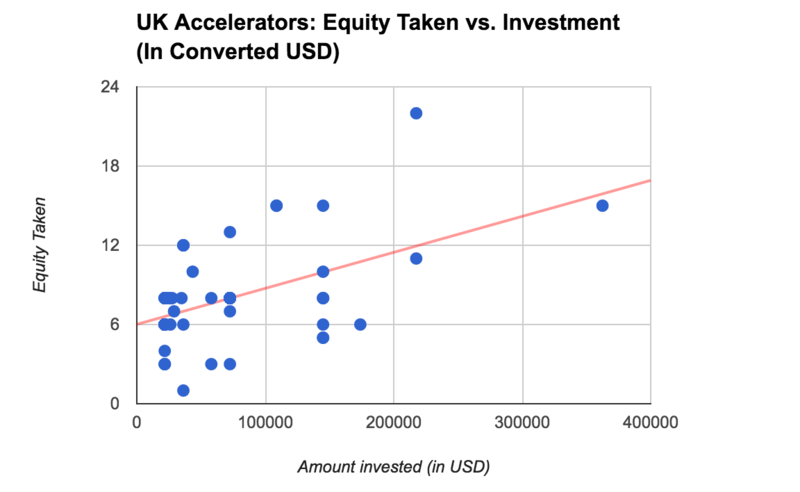 A lot of the time, to keep things simple from an accounting perspective, accelerators invest a fixed amount of money in exchange for a fixed amount of cash. Of course, those amounts vary from program to program. But here’s a question: is it possible to back out a trend line in the price of seed-stage startup equity? If so, does that price curve look different when comparing well-developed startup ecosystems around the world? In other words, where do entrepreneurs get the best deal for the equity they give up? The data we’ll use to answer this question comes from F6S. One of the many features of F6S is a list of accelerator and incubator programs around the world. 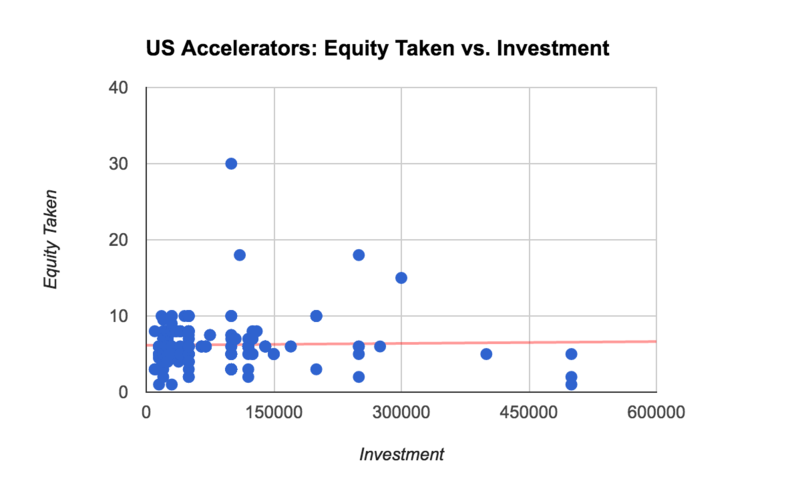 As it turns out, many of these incubator and accelerator programs state the amount of money they invest and, often, a fixed amount of equity they take in exchange for said investment. In order to keep our analysis relatively clean, accelerator programs have to meet a few criteria. First, we’ll look at programs that have investments listed in local currencies and at programs that take equity. (Those that take 0% equity or over 50% equity are not counted. Second, we’ll focus on those programs that invest less than $500,000 US dollars (or equivalent in foreign currencies, which rules out most outliers). Third, to compare apples to apples, we also converted foreign currency into USD at a rough average of 2015 foreign exchange rates. Of course, there are many more programs than what we account for here, but keeping these standards will give us a better approximation of the cost of seed capital in these markets. Our dataset has a total of around 700 programs that meet these criteria. We’re going to look at four different markets on two different continents. 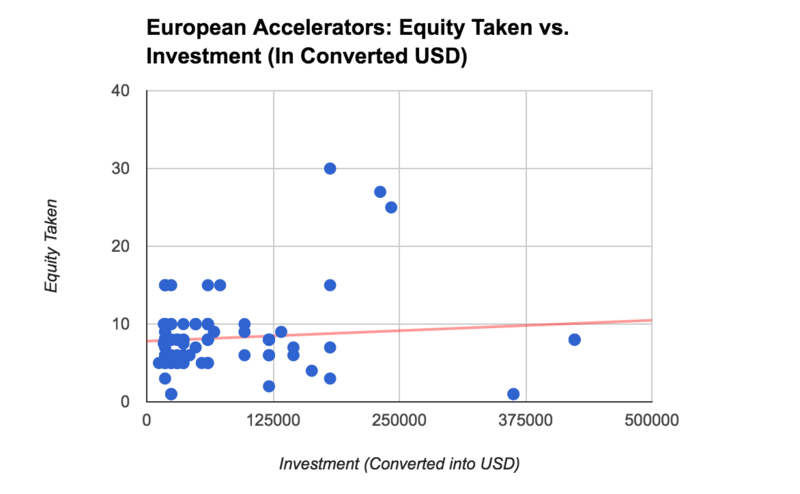 Canada, the United States, the UK and other large European countries in the Eurozone have very well developed ecosystems of accelerator programs, and those markets are well represented in the dataset we have. Here’s the price curves of each market we explore. The UK has sixty-eight programs that meet our analytical standards. Note the relatively steep slope and the small number of programs that invest more than the US equivalent of $200,000. But what about North America? Is the price curve more favorable to entrepreneurs there? 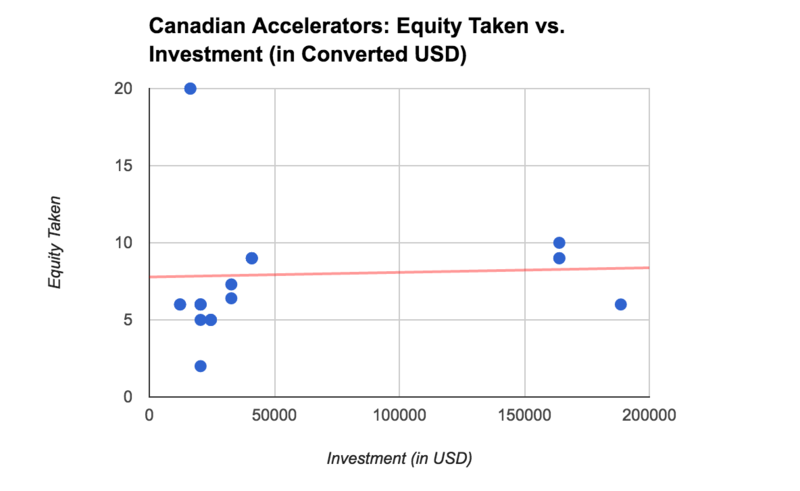 By rights, there isn’t enough data about Canadian accelerator programs to say anything definitive, but the plot of their 44 qualifying programs is worth sharing nonetheless. It’s when we start looking at the more than 300 qualifying programs in the USA that things get a bit more interesting. Based on what we find in the dataset we used, I conclude the US has a very flat price curve for seed and pre-seed stage equity and a robust set of programs offering up to $300,000 at multiple equity price points. In other words, there are favorable terms to be had for startups seeking all levels of very early stage funding, which is good news for entrepreneurs. What to make of this? It goes without saying that this is not a scientific or highly comprehensive study of the global price of startup equity, but it does help to affirm a number of trends. First, it does nothing to change the belief that the US is a good place to get a new technology company started and off the ground. Second, it shows the “movement” of building and funding startups through accelerators has really taken off in in established tech ecosystems like the UK, Germany and France, as well as emerging markets like Estonia, Bulgaria and Romania. What I didn’t discuss in depth here, but found in the data, is a large amount of free money in each of these markets. There are plenty of accelerator programs that give out tens or hundreds of thousands of dollars for no up-front equity. Whether or not taking money from any of these programs is a good idea is to be taken on a case-by-case basis. For every Mass Challenge, which is a superbly-run program, there may be others that aren’t so great. In this case, it’s important to remember that the first taste is always free.